Read a personal blog on the new law for gender recognition in Norway and how it came into place. Written by Norwegian activist and TGEU steering committee member Stein Wolff Frydenlund. 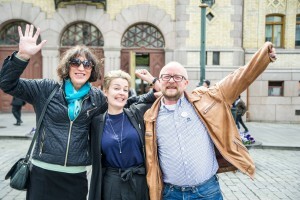 Norwegian activists celebrate the law, Stein Wolff Frydenlund on the right. I have been working on this issue since 2000, and the first proposal for a law for trans* persons came in December 2000 after I approached a representative from the Socialist left party (I was then a member of LFTS, now the Harry Benjamin Resource Center). It took about 16 years to get the law, and things really started rolling once we organised ourselves better and did political work within the organisations. It certainly has been crucial that three NGOs working on trans rights have worked close together. It has also been very important that Amnesty joined forces with us, and included Norway in their research and work on trans, leading to the report «The state decides who I am». This would not have happened had I not met the Amnesty representatives at the TGEU council in Dublin (in 2012), where I told them about the situation in Norway and asked them to include us in their research. They had planned to look at other countries and Norway was not on their list. Having the support from Amnesty led to speeding up the process and we most likely got a better result than would have been possible without them. The law is a big step forward and leads to a huge improvement for transgender persons in Norway. There are some things that could have been better, especially regarding a non binary gender marker, age limits and parental veto. The age limits are as in the proposition, i.e. lower age 6 years and parental consent from at least one parent between 6 and 16. There are clear implications in the proposition and the debate, that if parental vetoes becomes a problem, they will discuss and maybe revise the law in the future. It was great to listen to the debate and learn that there is a broad political agreement on the introduction of the LGR law, from the progress party (FrP) to the Socialist left party (SV) and the Greens (MdG). 78 voted for, 13 against (Christian democrats (KrF), Center Party (SP) and one social democrat (AP). The left parties praised the conservatives for good political work, and especially the minister of Health, Bent Høie. For now we celebrate and are very happy for the strong political support for our rights. It has been important to be part of an international movement and refer to good practices abroad when working on LGR in Norway.